The Nuremberg Symposium featured several high-profile thought-leaders and agents of change in the modern application of the lessons learned from the Holocaust. 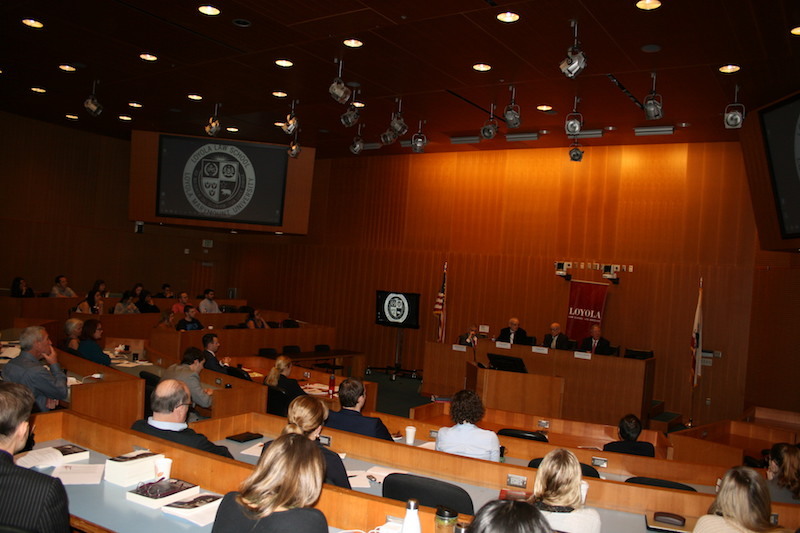 LOS ANGELES - March 1, 2017 - PRLog -- On Tuesday, February 28th, International March of the Living co-sponsored a Holocaust Educational Symposium on the Nuremberg Laws and the Nuremberg Trials, held at Loyola Law School of Los Angeles, in cooperation with the International and Comparative Law Review and Loyola Center for the Study of Law and Genocide. · Richard D. Heideman, Senior Counsel of the law firm Heideman Nudelman & Kalik, P.C., recipient of the 2016 Public Justice Trial of the Year Award and author of the article in the Special Edition of the Law Review entitled "Legalized Hate". · Dydine Umunyana, survivor of the Rwandan Genocide and author of "Embracing Survival." Harvard Law Professor Emeritus Alan M. Dershowitz and Benjamin B. Ferencz, the lead prosecutor of the SS-Einsatzgruppen Trial, prepared video recorded remarks that were presented as part of the program. Mr. Heideman noted that these laws began as "mantra of the government" and became "mantra of the people," ultimately shaping the German misguided view that violence towards Jews was consistent with the law. Applying the lessons of the Holocaust to today, further noted the uniquely hateful murder of six million Jewish men, women and children and that the state-sanctioning of hatred by the Nuremberg Laws also has contemporary legal implications as seen through the state-sponsorship of terror that exists today citing the heinous attacks sponsored by the Islamic Republic of Iran and also the attempts at genocide in Darfur, Rwanda, Yugoslavia and butchering in Syria as well as recent self-radicalized attacks such as the Boston Marathon bombing. Participants also discussed the Nuremberg Trials and its role in combatting contemporary genocide. Following the Holocaust, the Allied powers erected the International Military Tribunal in Nuremberg, where leading Nazis were sentenced to death for waging aggressive war, committing war crimes, and committing crimes against humanity. Many of the perpetrators went unpunished, but the Nuremberg Trials represented the first implementation of an international court of criminal law with a mechanism for enforcement. "A modicum of justice," Professor Berenbaum proclaimed, "is essential to our survival." Professor Bazyler presented video footage from the Nuremberg Trials, and explained that the documentary evidence produced at the trial has played an important role in shaping Holocaust education for future generations. The program also featured a panel on the "Contemporary Tragedy of Genocide," where Ms. Bryce discussed her prior experience performing humanitarian aid work in Sudan and South Sudan and Ms. Umunyana shared her account of surviving the Rwanda genocide when she was four years old. In connection with the Symposium, Loyola's International and Comparative Law Review, today published a "Special Edition Vol. 39: The Nuremberg Laws and the Nuremberg Trials," which includes articles submitted to the Law Review by leading scholars on Holocaust and international law, as well as transcripts from the presentations delivered at the International March of the Living's Nuremberg Symposium at Jagiellonian University. For more information, requests for photos, interviews and video link and the law review, contact Ariana Heideman Tipograph at ariana@motlmail.org. The International March of the Living is the premier Holocaust educational program which annually brings 10,000 students, survivors, liberators and other individuals from all over the world to Poland and Israel, on Yom Hashoa, Holocaust Memorial Day, to study the history of the Holocaust and to examine the roots of prejudice, intolerance and hate. Learn more at www.motl.org.